Craziest day? Right between Christmas and New Year, I got 6 different packages of games. Most of them were one or two games, but still! That’s a lot of gaming. Some exceptional games in there too! Let’s look at the better/more interesting games to come in. I won’t be looking at (most) expansions, since a lot of them are the simple, little expansions that are available on the BoardgameGeek store. Some of the games (Freedom: The Underground Railroad, Euphoria: Build a Better Dystopia, Hegemonic, Russian Railroads, and Trieste) I’ve already talked about in either my 10X10in2014 or my Year in review article (part 1, 2 and 3). Expect reviews of them in the coming weeks. 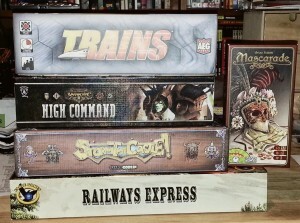 I’ve done a review of Council of Verona already and there should be reviews of the last few (American Rails, Trains and Stations, Legacy: The Testament of Duke de Crecy) as soon as I can get them to the table another time. This entry was posted in new to me and tagged Catch up on January 8, 2014 by TopDog. It’s been a while since I did a New to me post, but it’s not from wanting to buy new games. I’ve been trying really hard to keep my purchases to a minimum and catch up to my monumental stack of older, unplayed games (it’s now under 300, make of that what you will). While the willpower has been strong, it didn’t stop Kickstarter rewards and P500 from coming in, which is not a bad thing, really. This entry was posted in new to me and tagged Blood on the snow, Hillfolk, Navajo Wars, Tomorrow on November 2, 2013 by TopDog. This entry was posted in new to me and tagged dungeon roll, keyflower on September 4, 2013 by TopDog. Got two new RPGs from Pelgrane Press in the mail today, namely Skulduggery and The Esoterrorists 2nd Ed, both from Robin D Law. This entry was posted in new to me and tagged Skulduggery, The Esoterrorists on August 23, 2013 by TopDog.